(AP) TOKYO — Japanese researchers said Sunday that a bottlenose dolphin captured last month has an extra set of fins that could be the remains of hind legs, a discovery that may provide further evidence that ocean-dwelling mammals once lived on land. "I believe the fins may be remains from the time when dolphins' ancient ancestors lived on land ... this is an unprecedented discovery," Seiji Osumi, an adviser at Tokyo's Institute of Cetacean Research, said at a news conference televised Sunday. A freak mutation may have caused the ancient trait to reassert itself, Osumi said. 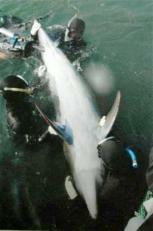 The dolphin will be kept at the Taiji museum to undergo X-ray and DNA tests, according to Hayashi."